Bus from KL to Dungun is the budget yet convenient mode of transport to travel between Kuala Lumpur and Dungun Terengganu for locals. Frequent bus schedule throughout the day provided by Transnasional makes it very convenient for locals travelling between the two cities. Besides locals Dungun residents, many tourists travel to Dungun for retreat in Tanjong Jara Resort. 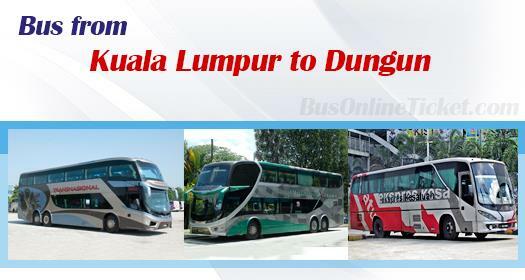 Plusliner, Transnasional and Kesatuan Express are the three branded bus companies operating bus from KL to Dungun. Transnasional is the largest player among them by having 8 daily departures from Terminal Bersepadu Selatan to Dungun. For both Plusliner and Kesatuan Express, they each supply 2 daily departures from Kuala Lumpur to Dungun. All three players are arranging SVIP coach with spacious seat to ensure passengers having comfortable travel experience. The duration required for bus from KL to Dungun takes about 5 hours depending on traffic condition. The portion of the journey at Karak Highway is one of the most notorious heavy traffics roads which is the most likely cause for a longer trip duration. Upon arrival, for those who are heading to Tanjong Jara Resort, another 15 minutes taxi from Dungun Bus Station is needed. The bus fare for bus from KL to Dungun is ranging from RM 36.00 – RM 40.00 per ticket depending on the choice of the bus operator. 1 stopover for washroom break will be provided during the journey. BusOnlineTicket.com offers convenient and delightful online booking experience to users. Passengers could save the hassle from travelling down to bus station to queue for bus ticket. Booking comes with instant confirmation upon payment from passengers.